Meetings have now concluded to discuss alternatives to extend the Crenshaw/LAX Line north with connections to the Expo, Purple and Red Lines as well as many heavily traveled bus lines. Above is a new presentation shown at the meetings along with an FAQ. Some quick background: the Crenshaw/LAX Line is a light rail line that is currently under construction and will run between the Green Line and Expo Line. That project is nearly complete and is scheduled to open in 2020. The Crenshaw Northern Extension is a Measure M-funded project that will continue the line north of the Expo Line, with the extension serving portions of the cities of Los Angeles, Beverly Hills and West Hollywood. A feasibility study for the project was released last summer with five potential routes — all with very high ridership estimates. This study will be used to help determine which routes will be studied further in a formal environmental study anticipated to begin in early 2020. Measure M allocates $2.24 billion to the northern extension with a groundbreaking date of 2041 and project completion date of 2047. So why the studies now in 2019? Because there are efforts underway to find the funding needed to accelerate this schedule. •The 2041 timeline included in Measure M was developed as part of a from-the-ground-up approach to identifying and developing a list of projects to be funded by the ballot measure. Cities were very much engaged in the process and aware of the project timelines. •The Metro Board adopted an Early Delivery Strategy that encourages cities to identify additional funding sources to accelerate their projects without impacting other projects that Metro has committed to deliver. •Metro is committed to working with the cities of West Hollywood and Los Angeles to find a way to accelerate this project — the reason Metro’s current study schedule lines up with the conclusion of a feasibility study that the city of West Hollywood is doing on acceleration (here is a city of WeHo staff report from last summer). This will allow the Metro Board to make an informed decision about next steps for the northern extension. •Measure M was designed to provide regional equity by spreading projects around L.A. County — so all local residents see the benefits of their tax dollars. This is why ballot measure dollars are not all being spent all at once in just one part of a very, very large county with mobility needs in many places. For more information, please visit metro.net/crenshawnorth. How about a sixth option. Go north to Hollywood/Vine Station and continue to Burbank Airport. I’m not from the LA area (I’m from New York City), but I got to visit Los Angeles three years ago and rode on all six of Metro’s rail lines. I have a major issue with the alignment of the northern extension of the Crenshaw/LAX and it’s simple. All this time I (and I’m sure many Angelenos) thought the line was going to West Hollywood via one of three alignments. I see now that there are five proposed alignments. A, B, C and D do go toward WeHo, but Alignment E is does no; Plan E is proposed to go to the Wilshire/Vermont station. (1) Why was E added and (2) is there a real possibility that the northern extension of the Crenshaw/LAX Line won’t go to West Hollywood? I won’t lie; extending the Crenshaw/LAX Line without it going to WeHo in some way is a non-starter, especially in a neighborhood that clearly wants a rail line! 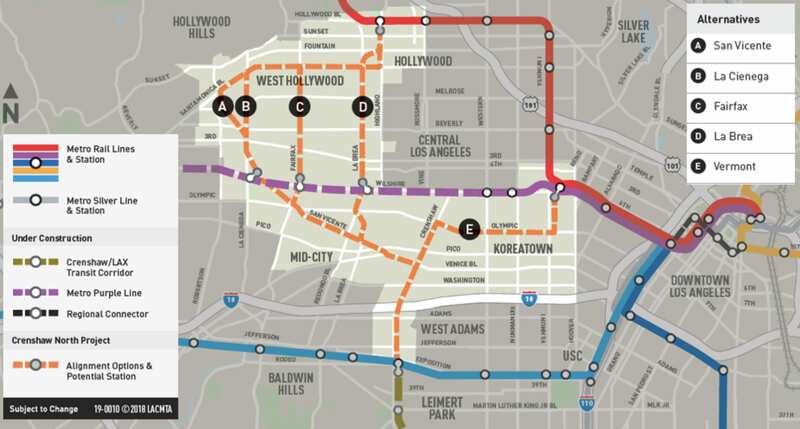 I hope Metro dropsd Alignment E and continue to find funding for the northern extension to West Hollywood. In early studies, Metro vies to investigate all possibilities out of due diligence to see what they might cost, what the issues are and how they may perform ridership-wise. This is part of that effort. That said, community support always matters and is often a very significant factor in choosing a route. And, that said again, please be mindful that this is a feasibility study and we’re very, very early in a long process. My fear is that if Option A is chosen, there is no future where the much needed Option C gets a rail line… If Option C is chosen for this project, we get a quicker direct airport connection as well as a much needed transit connection, AND Santa Monica Blvd gets a future intelligent design through a new project traveling further East through Echo Park & Silver Lake. The problem is funding and timeline, neither easy solutions. But we should consider first and foremost only connectivity and travel time. Regardless of route chosen, it would be nice to see a study on the financial possibilities of continuing the line for one additional stop north to the Hollywood Bowl. I understand some people would not feel its validity due to the sporadic schedule of events at the venue, but for anyone who has ever drive through the Cahuenga Pass, or attempted to exit Highland on a concert day, the extension would be PRICELESS. Option C (Fairfax alignment) makes the most sense. Along that alignment is LACMA, Hollywood Museum, Park La Brea residential complex, The Automobile Museum, Farmers Market and The Grove. Need I say more ? D is my first check, would accept C if the line south of Wilshire is somehow straighten as this line in its entirety from the Red line to either Redondo Beach or Norwalk wanders too much. A line this long needs to be straighter for the overall speed of the line. West Hollywood should get a different line branching off from the same Red Line terminal , out Santa Monica through the center of town and then turning south down La Cienega to Wilshire and beyond to Expo. Covers all end of the town and beyond and provides better connections in all directions to the other lines. All the alignments except the Vermont one follow a route that has constantly seen reduction in bus service thru the years along San Vicente Bl. While La Brea Ave via San Vicente seems like the most viable route. But we must demand more. Santa Monica Bl.is State Route 2 and said route was slated for an extension of the Glendale Freeway ( Highway 2) and was beyond shovel reading when Governor Brown killed it during his first reign in office. The monies allocated plus inflation for this freeway extension should be used to build a light rail line from Downtown to Santa Monica via Sunset Bl. to Santa Monica B. and continue west.